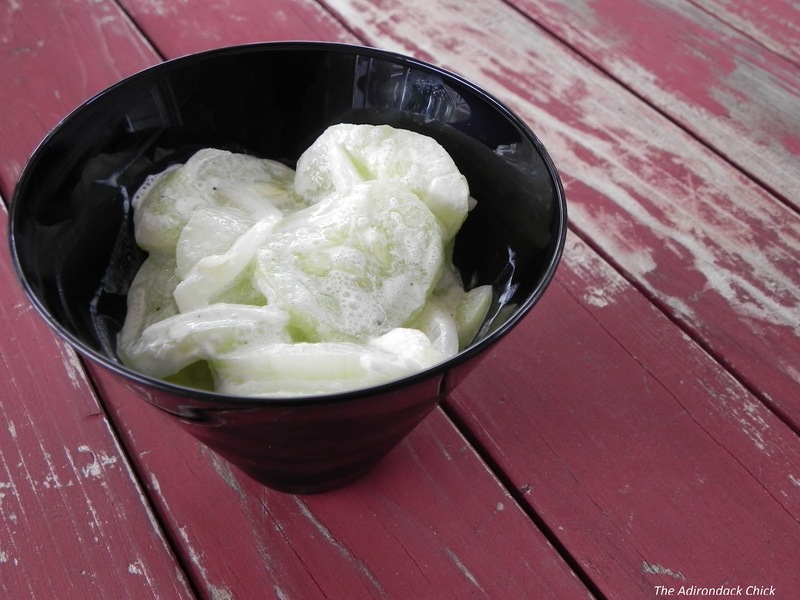 My Dad’s side of the family is a combination of basically Russian and Hungarian, and one thing that was always on the table no matter what the occasion was, was my Grandma Irene’s creamed cucumber salad. Everyone loved it, and I have been trying to create the exact taste for years. Sometimes it came too salty, other times there wasn’t enough vinegar. Sometimes, I just didn’t let the cucumbers sit long enough, because I didn’t allow enough time to make it. Since she had no recipe written down, there was nothing to go by. This recipe, however, has passed my Dad’s tough taste-test, and even though I’m not a big fan of sour cream, I absolutely love this salad, too. One thing I think really makes the difference is the brand of sour cream you use. I like Cabot for a number of reasons, including that there are no artificial growth hormones in their products. Of course I would also encourage you to use fresh-from-the-garden cucumbers like I did, because no matter what you are cooking, it’s going to taste better the fresher your ingredients are. It is also so cool and refreshing on a hot summer day! 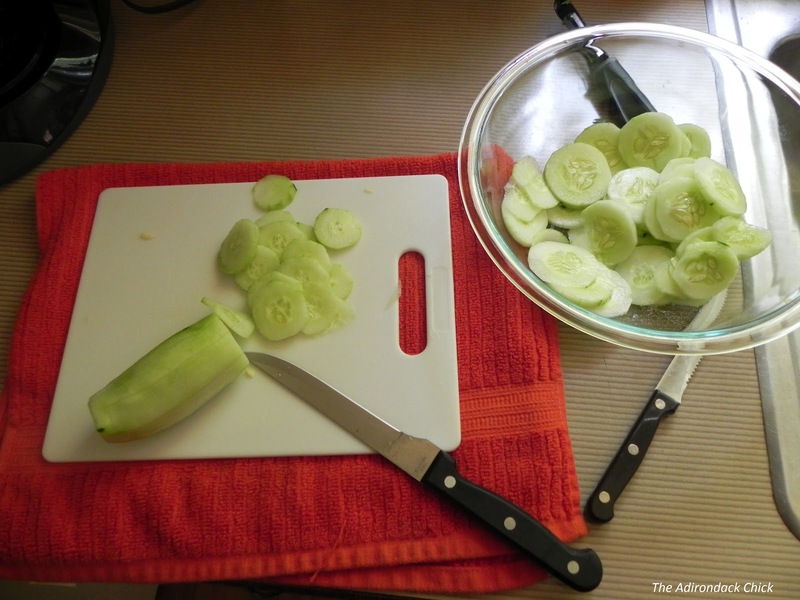 Peel and thinly slice the cucumbers. Place them in a large bowl. Put a few sprinkles of salt on each new batch you put in the bowl. Refrigerate for a minimum of 4 hours, and up to 24. The longer it sits the better. Remove from the refrigerator and drain into a colander. Place several paper towels on the counter. Dump the drained cucumbers on it. Place another set of paper towels on top and pat dry. Put the cucumbers back in the bowl. Slice the onions very thin, and add into the cucumbers. Stir in the sour cream and vinegar. Season with salt and pepper to taste. Michelle, I had forgotten all about this salad. My grandma used to make this and everyone in our family loved it too. Must go out an purchase some sour cream. Thanks for reminding me of this great dish. This salad is always so good! Thanks for sharing at Must Try Monday! The subject of this week's Food on Friday is Salad. It would be great if you linked this in. This is the link . I found this through Stone Gable. This looks great going to make it this weekend. Thanks for the posting. I have to admit I am not sure about this one!! What makes you not sure about it? Sound good, will have to try. Thanks for sharing.